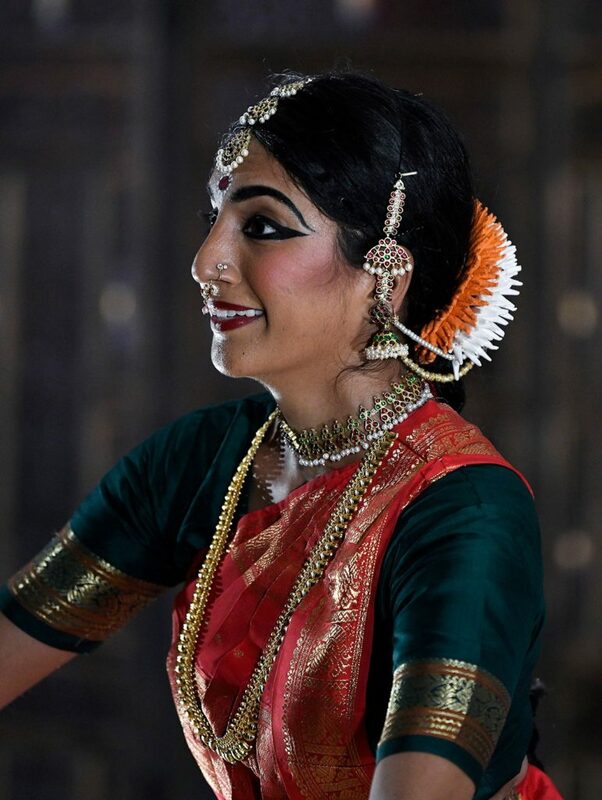 On March 2nd and 3rd, I had the fortune of watching a special ‘Festival of Solos’ dance show presented by Ramya Kapadia & Prakriti in Raleigh, NC. I was also honored to participate in a panel discussion on Margams, with other eminent dance teachers; Guru Asha Bala and Guru Meena Rajagopalan. I am myself a great fan and ardent practioner of excellence and creativity in group choreography. However, the true talent of a dancer and the authenticity of the art form, can only be observed in longer solo dance items. It is a shame that these have become rare. This is because of the lack of patience from audiences, the preference and necessity for organizers to fill up the stage with performers and other factors. The consequences of this are teachers and choreographers overload the stage with big groups, regardless of how much training the dancers have received and put up shows that are low on quality. But , who cares as long as you can take selected clips from these performances and post it via social media. The traditional Margam (repertoire) in Bharathanatyam is not complete without the challenging piece de resistence Varnam & a lively Thillana. It takes a lot of courage & conviction to stand up against the superficial social media world & do what you believe & are passionate about. The festival of solos was spread out on two different days at two different locations . Both these venues were cozy sitting areas with a small mini stage making it a perfect ambience to connect & relate to the dancer. On the first day there were two presentations. The 1st presentation was by Madhavi Venkatesh. Madhavi Venkatesh started off her presentation with a traditional opening item, pushpanjali which was set to a very appropriate & upbeat Ragam Gambeera Natai . Madhavi then performed the Varnam “Innum Yen Mannam” by Lalgudi Jayaraman in Charukeshi Ragam. She took off from the word go & did not take time to get into the mood of the composition. The traditional Trikala Jathi ( executed in 3 speeds ) composed & choreographed by Kasi Aysola was neatly delineated by Madhavi. The Varnam, had only 2 Jathis instead of the usual 4 before the Chitteswara, but it did not take away the essence of the composition & that is the whole message to this solo presentation. A Solo dance concert can be tailored to suit the audience & still do justice to the composer & keep the tradition intact. Madhavi ended her presentation with a composition by Annamayya, “Alarulu Kuriyaga” in Raga Shankarabaranam. In this piece she portrayed how Alamelumanga had enticed Lord Venkateswara in the game of love. Madhavi brought out the Vasakasajja Nayika bhava ( emotions) effectively. The 2nd presentation was from Vanita Todkar. Vanita started off her presentation with a Ganesha sloka in Hamsadhwani which was followed by a very traditional Varnam in Shankrabharana Ragam composed by Tanjore Quartet. The Tanjore brothers were pioneers & were solely responsible for the clean structure of a traditional Margam & their compositions were the epitome of tradition. This was followed by a very popular Padam “Theeradu Villiayattu Pillai” in Ragamalika & composed by Subramanya Bharathiyar. The composition & the melody have the ability to win hearts & when the dancer executes the various incidents & emotions well, which Vanita did, the joy is doubled. Vanita ended her dance presentation with a short & sweet Thillana composed in Raga Bhairavi by her own team mate & multi-talented Ramya Kapadia. The 2nd day’s program had duets and solos by Kasi Aysola & Ramya Kapadia. Both performers are very impressive & can keep the audience in a complete grip. They also create their own music, Ramya as vocalist and Kasi the percussionist. Their talents could be seen in both the pre-recorded music, used in their performance, as well as their dance presentations which had perfect lines, clean aramandis and absolute brilliance. They started off with a well-choreographed Allaripu duet. The presentation was very neat with all the required core elements present. The torso movements , the neck & eye movements were a delight to watch. This was followed by the traditional Varnam “Anandadayini”, composed by late Dr. Balamuralikrishna. The jathis were executed with perfect Anga Shudha & neat Aramandi and the Theermanams were executed to perfection. This was followed by solo items, 1 a piece from each one of them. Ramya performed a padam “Varugalamo Ayya”. The dance depicted how a devotee of Shiva, branded an untouchable, requests Him to let him into the temple and have a darshan. Ramya’s abhinaya was moving & touching. It was interesting to see Kasi Aysola, take on a Javali, whose theme is female-centric and the main character is always female. This one had a heroine that laments how the man who was with her last night is with an another woman, but in public boasts about his greatness & that she does not care to even think about him. These expressions are very hard to bring out for even a female but Kasi Aysola was marvelous with his abhinaya. Every bhava/ expression was carefully crafted with the exact dose of emotion without over acting. Hats off to this young man & his Guru for training him to this degree of perfection. They both concluded the recital with a short but brisk Tarana in Raga Puryadhanashree, again with music composed by Ramya & choreographed by Kasi. They were meticulous and well-synchronized. The two-day Festival of Solos ended with an interesting panel discussion from three well-known practitioners & teachers of this art form– Asha Bala , Meena Rajagopal & your’s truly. The enlightening discussion indeed transported the audience & the panelists to the rich past & reminded viewers that “Old will always remain Gold” for generations to come & one needs to learn the foundation & basics well without compromising in early stages of learning. The evening indeed was an assurance that classical dance & music are in safe hands with the Prakriti group.